Recently I was browsing the Los Angeles subreddit (as I’m apt to do) and I stumbled across a thread for an educational Kickstarter campaign that totally sparked my imagination, primarily because it’s about a cause that I’m truly passionate about: teaching young people science. It’s called LA Makerspace and it’s a community-based nonprofit organization with a mission to increase access to STEAM (science, technology, engineering, art, and math) education for kids and adults, regardless of ability to pay. This past fall LA Makerspace became the primary provider of STEAM education for the Los Angeles Public Library, offering the public free, family-friendly workshops at various LAPL branches. In addition to the public facing programs, they provide “train-the-trainer” professional development for LAPL library staff where librarians learn to develop and execute STEAM events at their own libraries. And really that’s just the tip of the iceberg. Over the past week or so I was able to speak with a number of the key members of the team at LA Makerspace so I could fully grasp the vision and scope of what they’re trying to accomplish. Frankly, the more I learned about it, the more I was impressed. Hence, I wanted to share these learnings with everyone over at We Like L.A. to see if it’s something you guys might be passionate about too. In that vein, here’s a list of reasons I think what LA Makerspace is doing is pretty badass. 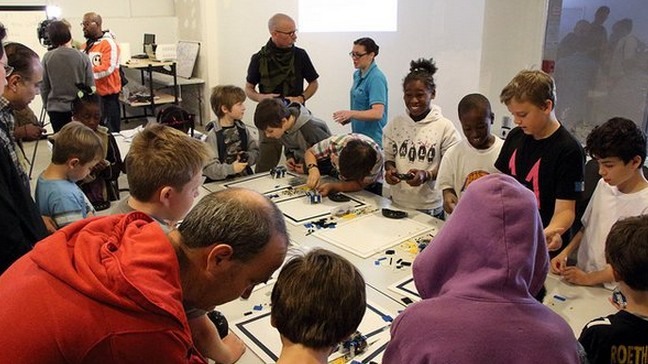 This was the first thing that grabbed my attention, and personally I think the concept of robotics is a great gateway to encourage young people to engage with the sciences. Even the small achievement of building a super basic robot (like 4 legs with a circuit and a power source) can spark the imagination of a youngster to continue his or her exploration of science, technology, and just ‘making’ stuff. And that’s a truly awesome thing. 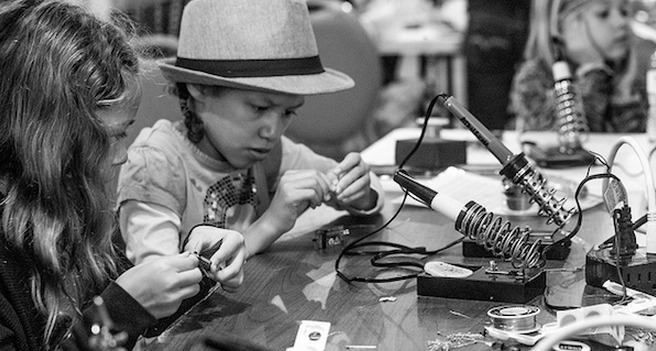 By creating workshops to provide the skills necessary for a library educator to pass this knowledge along, LA Makerspace empowers local library branches to bring science to the masses, and hopefully spark the minds of some of L.A.’s future genius creators. Can you imagine a world where local libraries are true hubs of innovation, learning, technology, and discussion? Where kids want to go to everyday after school because it’s where all the cool stuff is happening? LA Makerspace can, and that’s what they aim to achieve. Citizen science is scientific research conducted, in whole or in part, by amateur or nonprofessional scientists. Basically, it’s the crowdsourcing of scientific research, whether for purposes of either gathering mass amounts of data or to provide more eyeballs and minds to analyze it when scientists don’t have the resources to do so. 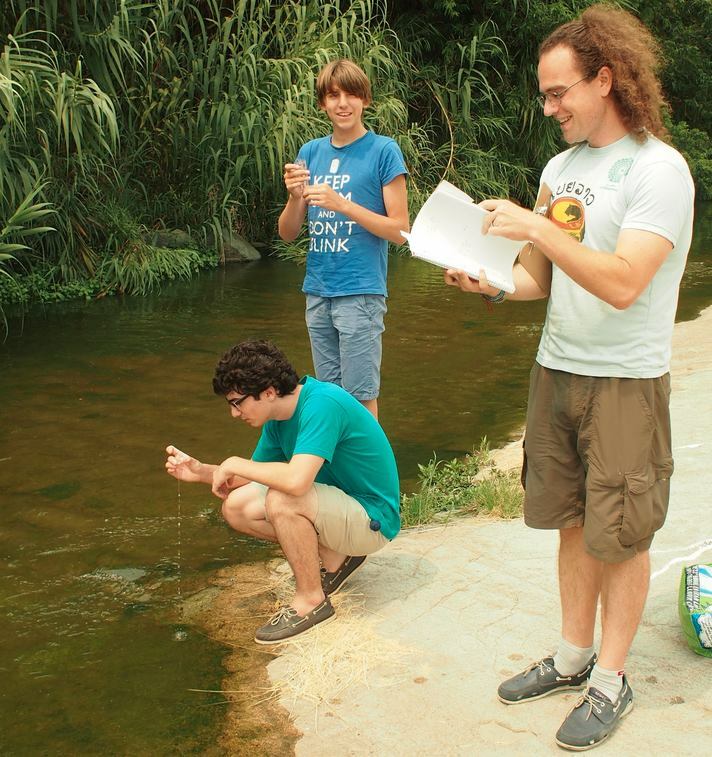 In the case of LA Makerspace, instilling a spirit of citizen science for angelenos is beneficial not only for local research (like measuring chemical levels of the L.A. River) but because it endows everything who participates with a scientific mindset. In the coming year Simmons is leading two new projects on the citizen science front. One is to measure the diversity of places selling food, and compare these results to the presence of food deserts. The other project is to start mapping out the spread of this invasive beetle, known as polyphagus shothole borer, which has started causing damage to a number of tree species in coastal California. One of the core tenants of the non-profit is that a ‘makerspace’ is pretty much anywhere a maker chooses to make stuff. And they want this to be as many places as possible! Part of this is expanding public courses in library branches in robotics, 3D printing, tabletop filmmaking, stop motion animation and coding with a goal to expand programming to 30-40 branches out of LAPL’s total 72 this year. Moreover, LA Makerspace also does satellite workshops and special events that can be requested on demand. There’s even a ‘Scratch Squad that teaches Scratch (a free desktop and online multimedia authoring tool that can be used by students, scholars, teachers, and parents to easily create games and provide a stepping stone to the more advanced world of computer programming) all around Los Angeles in special sessions designed to provide kids a pathway to learning real programming skills. And man, how many times have we heard about kids needing to learn programming languages to adequately equip them for the future, yet local schools are still woefully lacking in this type of education. The good news is that LA Makerspace is meeting that challenge… and they’ll even come to you! Adult education is huge part of what LA Makerspace does, and this is extraordinarily valuable not only to provide the skills necessary for instructors to be able to connect with their students, but moreover because it reminds the grownups that learning should be a lifelong skill. Never forget how to be curious! Speaking of adult education, one of the best ways to reach kids is to utilize a tool they’re already interested in, then engage them with it to encourage creativity, exploration, and curiosity. And you know what? Minecraft is freaking perfect to do just that. So why do we even need a program like LA Makerspace? According to the LAEDC Institute for Applied Economics Los Angeles County has the largest number of available STEAM (Science, Technology, Engineering, Arts, and Math) jobs in the country (nearly 800,000). And yet 90 % of LAUSD 8th graders test below proficient in science, and 82% test below proficient in math. What does that say about where we’re headed as a city? The good news is that programs like LA Makerspace can help to reverse those trends and, ultimately, pave the way for new types of science and technology education in our local schools. Their latest Kickstarter campaign has goal to fund a $15,000 project to educate 600 L.A. librarians and assist them in providing 18,000 educational experiences to angelenos. I strongly urge you to, at the very least, watch some of the videos on the campaign page and spread the word about this awesome, community based program that’s happening right under our noses. And if the spirit moves you, as it did me, maybe even make a donation. Go science, and go Los Angeles!